19 km from Rodez, 25 km from Rodez Airport and just 300 m from a lake where you can fish and swim, Hôtel Le Palous offers a bar, restaurant and free Wi-Fi. For breakfast, guests can enjoy fresh products including fruit and bread. The restaurant serves traditional food and the bar offers an array of drinks. It is possible to eat outside on the terrace weather permitting. 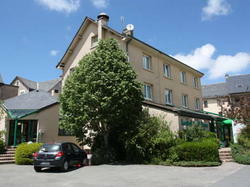 Hôtel Le Palous is surrounded by walking and cycling paths and there is free on site parking. Conque is 40 km from the property and Sauveterre de Rouegue, classified one of the most beautiful towns in France, is 15 km away.